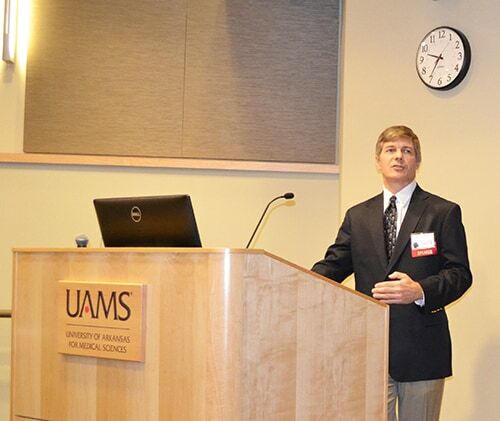 About 160 physicians, nurses and physical therapists came to the first Neurosciences Conference at UAMS. Aug. 31, 2018 | Aug. 31, 2018 | Debuting Aug. 23, the first Neuroscience Conference at UAMS quickly proved itself, attracting an audience of 160. 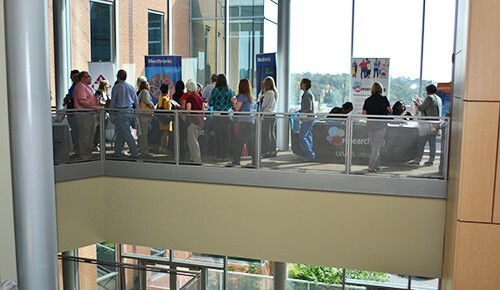 About 160 physicians, nurses, pharmacists, physical therapists and members of the public listened to presentations on topics ranging from ways to treat aneurysms, the 10-year history of the stroke telehealth program, and palliative care. Martin Radvany, M.D., discussed the latest research findings about non-traumatic subarachnoid hemorrhage and the best ways to treat it. Martin Radvany, M.D., a professor and the chief of Interventional Neuroradiology in the College of Medicine Department of Radiology, gave the audience an overview of the latest treatments and research findings regarding non-traumatic subarachnoid hemorrhage (SAH). Traumatic head injury is the most common cause of an SAH, but the focus of Radvany’s presentation was the variety of types and treatments for the hemorrhage caused by ruptured aneurysms. An aneurysm is a localized enlargement of an artery caused by a weakening of the artery wall. The hemorrhage occurs when an aneurysm bursts and bleeds in the space between the arachnoid membrane in the outer tissue of the brain and matter surrounding the brain. 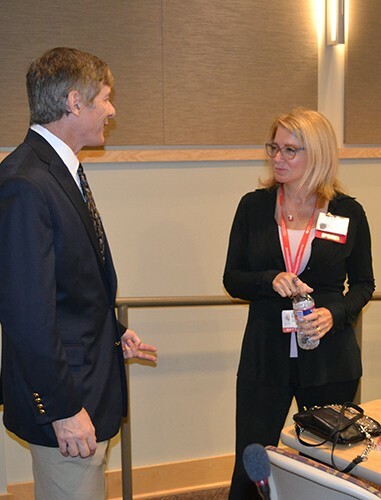 Radvany, left, and Aliza Brown, Ph.D., visit briefly after his lecture and before Brown spoke at the conference. Radvany said 40 percent of patients with aneurysmal SAH die before they reach the hospital and 20 percent die while in the hospital. . The average age of a patient is 55, and a patient typically spends at least 14 days in an intensive care unit. He reviewed several different types of SAH and their treatments. Aliza Brown, Ph.D., an assistant professor in the College of Medicine Department of Neurology and the Department of Radiology, reviewed the state of stroke care in Arkansas. Although stroke is a leading cause of death in the state, killing about 1,700 Arkansans in 2014, the state is making progress in fighting it. 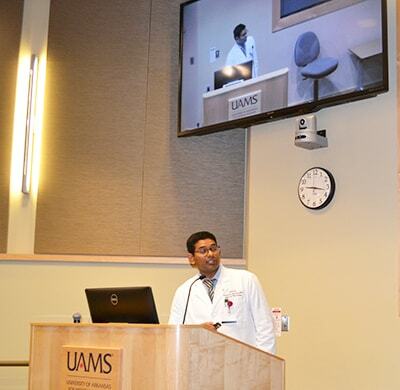 Sanjeeva Enteddu, M.D., spoke about the advances in acute stroke care guidelines. communication enables a stroke neurologist to evaluate whether emergency room physicians should use a clot-busting blood thinner (Alteplase) within the critical three-hour period following the first signs of stroke. Arkansas ranks sixth in the nation in stroke death rates. Surviving a stroke is becoming more likely as community hospitals have joined the SAVES network, now comprised of more than 50 hospitals. Brown presented the results of several studies of stroke care in the state in which she has been involved. One 2014 study’s results indicated that the highly specialized care at the two primary care stroke centers and the smaller rural hospitals in the AR SAVES network, what are called ‘stroke-ready hospitals’, were underused at 12 percent and 53 percent respectively. Approaches for improvement of stroke care include making more hospitals stroke ready, and educating the public to recognize the signs of stroke and the importance of calling 911, teaching paramedics the best ways to diagnose and where to transport stoke patients, and providing essential training to non-medically trained 911 dispatch operators through a mobile phone app, WeTrain911. Several vendors also had booths at the conference. She said stroke education at local sporting events in rural Arkansas towns have been especially effective at reaching large numbers of people at once. Arkansas is ranked as sixth among states for stroke deaths, an improvement from a No. 1 ranking a few years ago. Eleven speakers spoke or participated in 10 different presentations or panel discussions during the conference. Other topics addressed by presenters ranged from comprehensive stroke center certification, rehabilitation for stroke patients, and palliative care.